I’ve been wanting to try baking these for quite some time now and finally managed to do it. Unlike NY style bagels these are not boiled, but rather baked and dipped in a sweet pomegranate molasses and sesame seed mixture which gives these bagels a very unique flavor. I converted a recipe using instant yeast to sourdough I found in The Palestinian Table by Reem Kassis. My mother starter is kept at 66% hydration so if yours is different you can adjust accordingly. 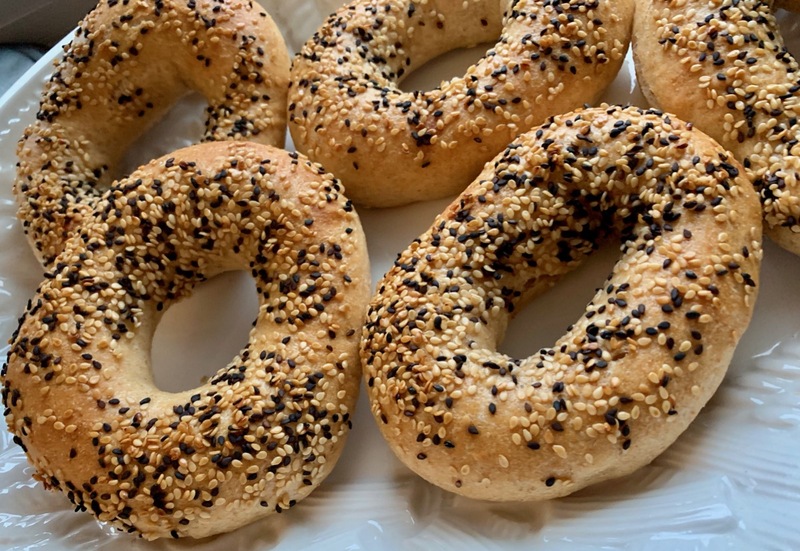 I have never eaten the authentic Jerusalem Bagels so I have nothing to compare them to, but I do have to say they were pretty awesome especially eating one a few minutes after baking. The sesame seed pomegranate topping mixture really gives these a unique flavor and they were also great the next day re-heated or toasted with some butter or cream cheese. 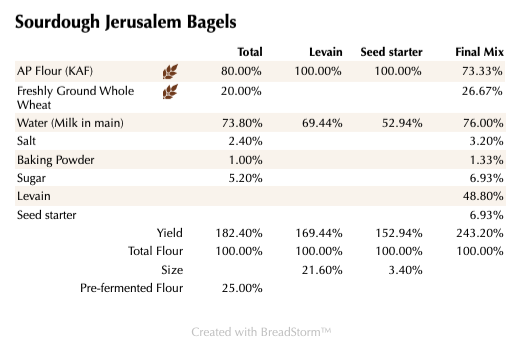 Please note, the sesame topping amounts listed made almost double of what is needed for this amount of dough. You can easily cut it in half unless you are making a larger amount of dough. Here are the Zip files for the above BreadStorm files. Mix all the levain ingredients together for about 1 minute and cover with plastic wrap. Let it sit at room temperature for around 7-8 hours or until the starter has doubled. I used my proofer set at 83 degrees and it took about 4 hours. You can use it immediately in the final dough or let it sit in your refrigerator overnight. Mix the flours and the milk for about 1 minute. Let the rough dough sit for about 20 minutes. Next add the levain, baking powder, sugar and salt and mix on low for 5 minutes. Remove the dough from your bowl and place it in a lightly oiled bowl or work surface and do several stretch and folds. Let it rest covered for 10-15 minutes and then do another stretch and fold. Let it rest another 10-15 minutes and do one additional stretch and fold. After a total of 2 hours place your covered bowl in the refrigerator and let it rest for 12 to 24 hours. (Since I used my proofer I only let the dough sit out for 1.5 hours before refrigerating). When you are ready to bake remove the bowl from the refrigerator and let it set out at room temperature still covered for 1.5 to 2 hours (or 1 hour if using a proofer set at 78 degrees). Prepare the topping while you are waiting for the dough to come to room temperature. Mix the seeds, pomegranate molasses with the hot water in a shallow baking dish that is around 1 1/2 qt/1,5L oval size or square. Make sure the seeds are nice and damp but not clumpy. You can add some more water if necessary. When the dough is ready, divide into 6 equal pieces and form each one into a ball. Poke a hole through the middle and stretch the dough outward to create an oval ring about 6″ long. Try to use your fingers and make the whole as large as you can. Let the bagels rest on a baking sheet with parchment paper for around 1 hour until they are getting nice and puffy. While they are resting, preheat your oven to 425 degrees Fahrenheit. 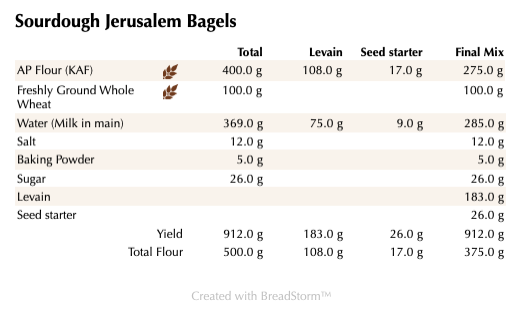 When ready to bake, dip each bagel into the seed mixture and press top of each so they stick and cover the entire surface. Try to pull the dough a bit more and make the hole larger if possible. 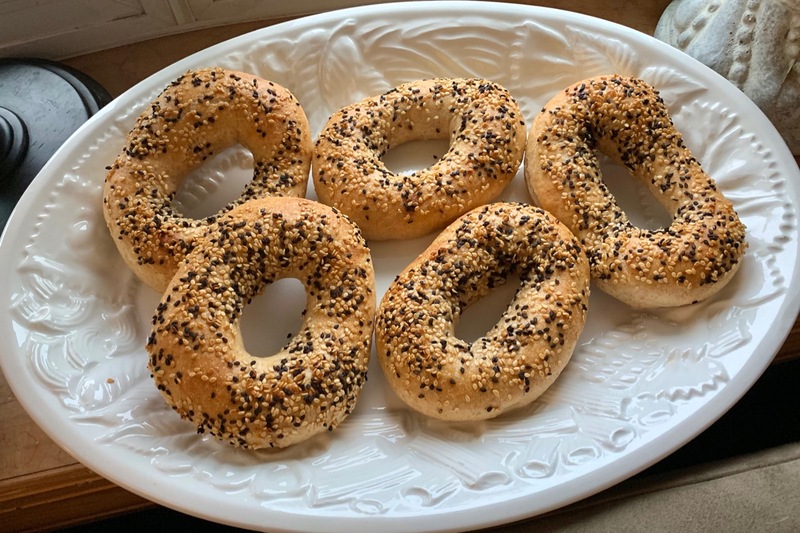 Place the bagels onto the baking sheet and let them rest for around 15-20 minutes. The original recipe did not use any steam, but I always like to, and recommend you do the same. 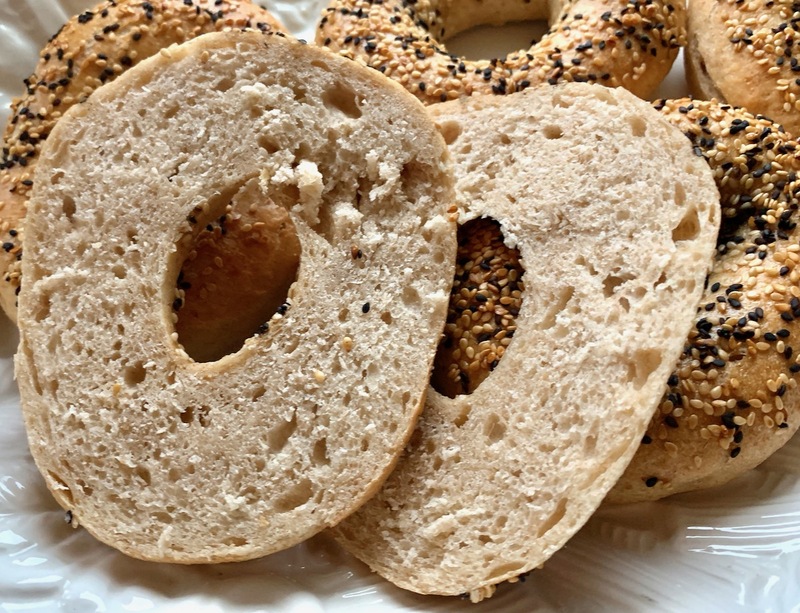 Bake the bagels with steam, for 15-20 minutes until they are nice and brown. Remove the and place on a cooling rack. Eat them when they are still warm and enjoy! Yeast Spotting Yeast Spotting is great website with links to weekly artisan bread recipes.